^ Around 20 Islamic State members in custody over Istanbul airport attack: Erdogan. Reuters. 2016-07-02. ^ Istanbul Ataturk airport attack: Deaths rise to 42 as Turkey mourns. BBC News. 2016年6月29日 [2016年6月29日]. ^ ISIS Believed Responsible for Istanbul Airport Attack; At Least 50 Dead | The American Spectator. spectator.org. 2016年6月28日 [2016年6月29日]. 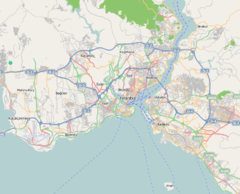 ^ 4.0 4.1 4.2 4.3 Explosions reported at Istanbul’s Ataturk Airport. rt.com. 今日俄罗斯. [2016年6月28日]. ^ 5.0 5.1 5.2 Blast and gunfire 'at Istanbul airport'. bbc.com. 英国广播公司. [2016年6月28日]. ^ Tavernise, Sabrina; Yeginsu, Ceylan. Attack at Istanbul Airport Leaves at Least 31 Dead. 纽约时报. 2016年6月28日 [2016年6月29日]. ^ 7.0 7.1 Calderwood, Imogen. BREAKING NEWS: Two explosions and gunfire at Istanbul's Ataturk airport cause multiple injuries. dailymail.co.uk. 每日邮报. [2016年6月28日]. ^ 土机场遭袭：总理称初步证据指向IS 有外国人遇难. 中新网. 中新社. 2016年6月29日 [2016年6月29日]. ^ Istanbul airport attackers 'Russian, Uzbek and Kyrgyz' - BBC News. BBC News. 2016-06-30 [2016-06-30]. ^ 中国驻土耳其使领馆积极协助在土中国公民及华人华侨等应对恐怖袭击. fmprc.gov.cn. 2016年6月29日 [2016-07-01]. ^ Istanbul Ataturk airport attack: At least 10 reported dead. BBC News. [2016-06-28]. ^ Istanbul airport attack: Video shows security officers take down gunman before explosion. [2016-06-29]. ^ Outlawed TAK Will Not Deviate Line of Öcalan(PKK). Al-Monitor. 2016-02-29. （原始内容存档于2016年7月1日）. ^ Istanbul blast: 11 dead in bomb attack on police vehicle. The Guardian. 2016-06-07. ^ Turkey paying a price for Erdoğan's wilful blindness to Isis threat. The Guardian. 2016-06-30 [2016-06-30]. ^ Turkey, a Conduit for Fighters Joining ISIS, Begins to Feel Its Wrath. New York Times. 2016-06-29 [2016-06-30]. ^ What the horror in Istanbul reveals about the fight against the Islamic State. Washington Post. 2016-06-29 [2016-06-30]. ^ US congressman: Chechen extremist behind Istanbul attack. Associated Press. 2016-07-01 [2016-07-01]. ^ Faith, Karimi; Steve, Almasy. 2 Istanbul airport bombers identified, state media says. CNN. 2016-07-01 [2016-07-01]. ^ Akyavas, Aziz; Engel, Richard; Windrem, Robert; Johnson, Alex; Ortiz, Erik. Explosions Rock Istanbul Airport, Multiple Deaths Reported. NBC News. 28 June 2016 [2016-06-28]. ^ Matt Payton. Turkey airport attack: Ten dead after explosions and gunfire reported at Ataturk International airport in Istanbul. independent.co.uk (The Independent). [2016-06-28]. ^ Istanbul Airport Attack. www.snappytv.com. [2016-06-29]. ^ CNN Video CCTV of Istanbul Airport attacks. Snappy TV. [2016-06-29]. ^ Tavernise, Tim Arango, Sabrina; Yeginsu, Ceylan. Attack at Istanbul Airport Leaves at Least 36 Dead. The New York Times. 28 June 2016 [2016-06-29]. ISSN 0362-4331. ^ CCTV footage shows moment police officer tackles Istanbul suicide bomber. The Independent. 2016-06-29 [2016-06-29]. ^ Gul Tuysuz, Mohammed Tawfeeq and Steve Almasy. Istanbul airport explosions: 28 dead, 60 injured, Turkish official says. CNN. [2016-06-29]. ^ Passengers flee, hide at Istanbul airport - CNN Video. CNN. [2016-06-29]. ^ Attacker 'randomly opened fire' before Istanbul airport blasts - witness - World | The Star Online. [2016-06-30]. ^ Deadly Explosions Spread Panic Through Istanbul Airport. [2016-06-28]. ^ Steinbuch, Yaron. Death toll rises to 41 in attack at Istanbul airport. New York Post. 2016-06-29 [2016-06-29]. ^ The Latest: Death toll in Turkish suicide attack at least 44. metronews.ca. 2016-06-30 [2016-06-30]. （原始内容存档于2016-06-29）. ^ At least 36 killed in Istanbul terror attack; FAA suspends U.S. flights to, from Atatürk Airport. [2016-06-29]. ^ News, A. B. C. US-Istanbul Flights Briefly Suspended After Terrorist Attack. ABC News. 29 June 2016 [2016-06-29]. ^ Jones, Marcy. US airports step up security following Turkey attack. Fox 10 Phoenix. [2016-06-29]. ^ Ken Dilanian and Andrew Blankstein. After Istanbul Attack, Security Stepped Up at U.S. Airports for Holiday. NBC. [2016-06-29]. ^ Efek Bom di Turki, Bandara di Indonesia Berstatus Kuning. TEMPO. [2016-06-29]. ^ Security stepped up at airports, Taj hotel after call warns of terror attack. The Indian Express. [2016-06-29]. ^ Security stepped up at Kolkata airport. India Today. [2016-06-29]. ^ #PrayForTurkey: Show of solidarity after Istanbul attack. BBC. [2016-06-29]. ^ Istanbul Airport Attack – Wednesday's reactions. BBC. [2016-06-30]. ^ @wembleystadium. The #Wembley arch will tonight be lit red in support of all those affected by last night's attack in Istanbul (推文). 2016-06-29 –通过Twitter. ^ From Australia to US, cities light up for Turkey as darkness falls (PHOTOS). RT. 2016-06-28 [2016-06-29]. ^ The Latest: PM: 36 people, 3 bombers dead in Istanbul attack. Associated Press. 2016-06-28 [2016-06-29]. ^ Turkey declares day of national mourning after Istanbul attack. Hurriyet Daily News. [2016-06-29]. ^ The Latest: Flights resume from US to Istanbul airport. Fox Carolina. [2016-06-29]. （原始内容存档于2016-06-30）. ^ Turkish forces detain 22 in Ataturk Airport terror attack. CNN. [2016-06-29]. ^ World condemns Istanbul airport terrorist attack. Anadolu Agency. 2016-06-29 [2016-06-29]. ^ Statement attributable to the Spokesman for the Secretary-General on terrorist attack in Turkey. UN. 2016-06-28 [2016-06-29]. ^ Deborah Danan. Israeli Opposition Leader Condemns 'Heinous' Turkey Airport Attack. Breitbart. 2016-06-29 [2016-06-29]. ^ Taiwan issues travel alert for Istanbul. Focus Taiwan. 2016-06-29 [2016-06-29]. ^ Ukraine MFA issues travel alert to Ukrainians traveling to or via Istanbul. Ukrinform. 2016-06-30 [2016-06-30]. ^ Peat, Charlie. Travel Warning: Turkey terror threat remains ‘HIGH’ after deadly Istanbul suicide bombings. Daily Express. 2016-06-29 [2016-06-29]. ^ In Turkey, suicide bombers are targeting tourists. Boston Globe. 2016-06-29 [2016-06-29]. ^ Turkey attack sparks new U.S. fears. Boston Herald. 2016-06-29 [2016-06-29].